Ever had that morning annoyance of literally crossing paths with your partner in the bathroom when bleary eyes are barely open? Well it’s fair to say that that’s unlikely to be an issue in this spacious, smartly laid out master suite. 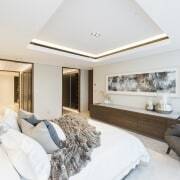 The master suite forms part of a new home by developer and homeowner Claude Giorgi. He wanted the master suite to be timeless and classic – offering a striking yet restful ambience. “And this was partly achieved by the bold, symmetrical layout of the entire suite,” he says. 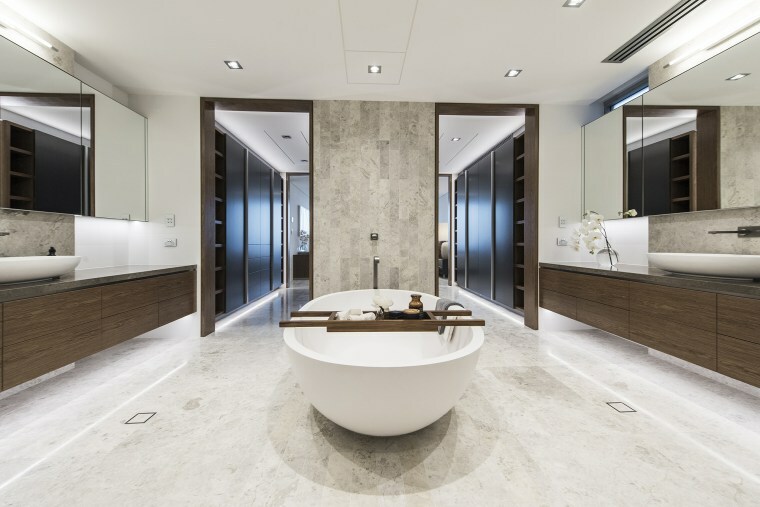 In this master ensuite, oval countertop basins on the respective his and hers vanities, echo the form of the sculptural tub centred between them. Handle-free drawers add to the bathroom’s clean-lined almost minimalist aesthetic. 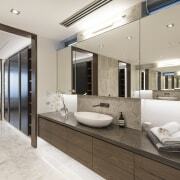 A wood panel at the end of the room balances the wood robe cabinetry at the entry to the ensuite. The shower leads off to the right of this panel. 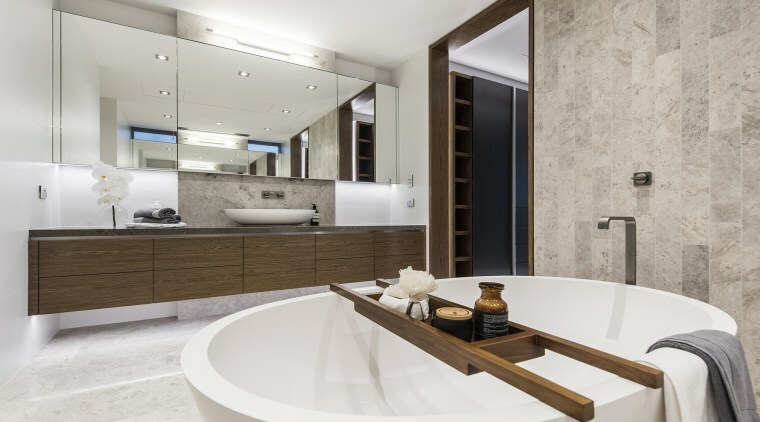 And once in the bathroom, the symmetry is continued, with his and hers vanities and benchtops set apart on opposite sides of the room – so no chance of sleepy early-morning collisions. The shower stall and toilet cubicle are set to the left and right at the end of the generous space. However the luxury of dedicated personal space is only part of the allure of this ensuite – the material palette is equally appealing. 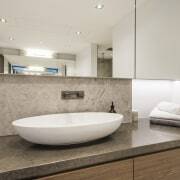 “Natural stone is used right through the space, from the floors to the feature walls and benchtops,” says Giorgi. 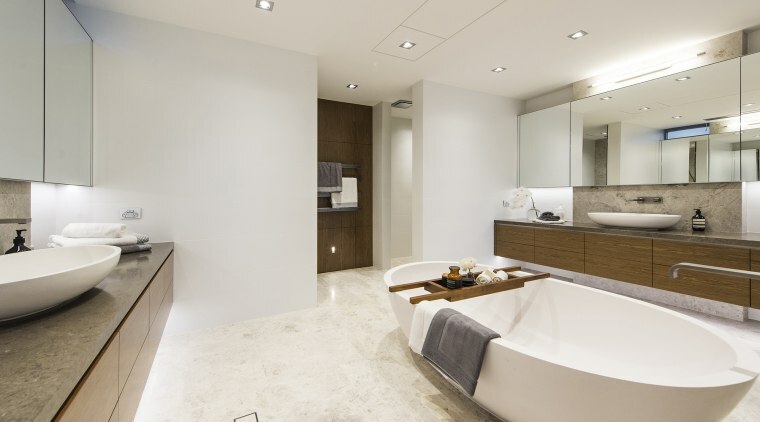 “This includes on the two accent walls that rise floor-to-ceiling behind the centre of each vanity. Soft Tuscan chestnut veneer cabinet doors and wall panels add to the enduring elegance and warmth required by the homeowners. The same wood is also used for the bespoke walk-in robes between the two rooms. The feature wall behind the bathtub in this master ensuite by Giorgi Architect and Builders continues the strip of feature floor tiling that runs right across the bathroom. Completing the tonal and material palette, graphite coloured tapware is paired with the above-counter stone basins. These in turn are complemented by the deep-toned benchtops. Graphite-toned heated towel rails also feature. The upper cabinets include mood lighting, adjustable shelving and internal power points – so the ensuite is as functional as it is arresting. Last but not least, the master ensuite’s many natural surfaces are bathed in morning light thanks to the inclusion of two high clerestory windows. The two banks of mirrors opposite each other reflect the occupants on into infinity and similarly help optimise natural light play.